A Texas sheriff said he could potentially bring charges against the owners of a truck with an anti-Trump widow decal, angering First Amendment activists who say the officer is using his position to silence free speech. 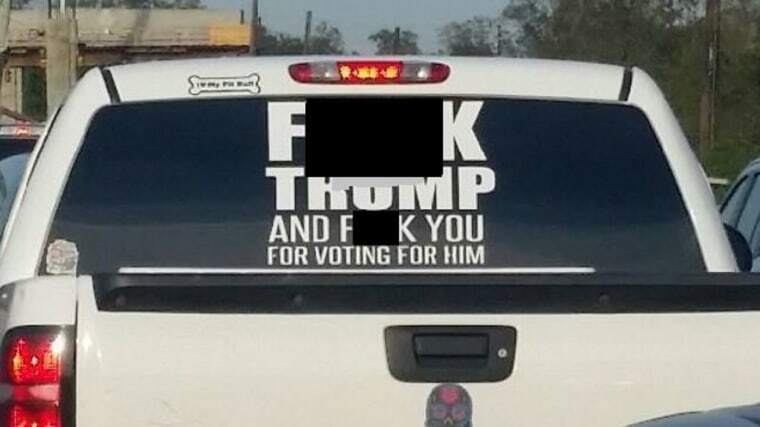 In a Facebook post that has since been deleted, Fort Bend County Sheriff Troy E. Nehls asked residents to help locate the owners of a truck with a window decal that proclaims "F— Trump and f— you for voting for him." Nehls wrote he's received "numerous calls" from drivers who are offended by the profanity in the message. "Our prosecutor has informed us she would accept disorderly conduct charges regarding [the decal], but I feel we could come to an agreement regarding a modification to it," he wrote in the post. But Karen Forsenca, the truck's owner, was defiant Wednesday, telling NBC-affiliate Click 2 Houston that she does not plan on removing the decal, which has been on the truck for nearly a year. She also said she thinks Nehls is violating her rights by issuing a public call to find her. "I thought the whole thing was totally crazy because it’s been on there for such a long time,” she said. "I feel it’s an invasion of privacy and every thing else because putting me on his Facebook page as a blast." Forsenca told Click 2 Houston that she's been pulled over by multiple officers for driving with the sticker, but she said they ultimately let her go. "I’m like they’re going to give me a ticket. If you can show me in the law book where you can give me a ticket — they couldn’t find the code so they couldn’t give me a ticket,” she said. "There is no law against freedom of speech in Texas," she added. As a mother of 12, Forsenca said she understands why parents might be upset with the window decal, but she added that she doesn't see a difference in her sticker and the language used online. "This is nothing," she said. "Unless you're going to put your kids in a bubble, you can't blame it on your children." Hours after Nehls' post went up, the ACLU of Texas slammed the sheriff for threatening free speech, citing a Supreme Court decision that overturned a conviction for disturbing the peace because the defendant wore a jacket with profanity on it. Nehl's post sparked a swift backlash on social media, with some praising the sheriff for his decision to find the driver. Others, however, have accused him of launching a politically motivated attack against the driver because Nehls, a Republican, has announced that he is "seriously considering" a run for Congress in 2018. In February, Nehls tweeted that he is forming an exploratory committee to run for the Texas 22nd Congressional District, according to Click 2 Houston.